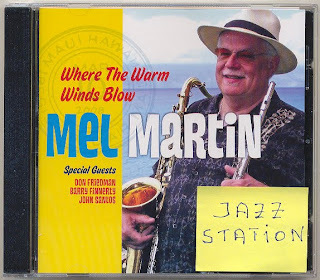 Jazz Station - Arnaldo DeSouteiro's Blog (Jazz, Bossa & Beyond): Instrumental CD of the Month - "Mel Martin: Where The Warm Winds Blow"
Instrumental CD of the Month - "Mel Martin: Where The Warm Winds Blow"
Featuring: Mel Martin (soprano & tenor sax, clarinet, bass clarinet, flute & alto flute), Don Friedman (piano & Fender Rhodes), Robb Fisher (bass), Jeff Marrs (drums), John Santos (congas & percussion), and Bard Buethe & Barry Finnerty (guitars). A massive set by the multi-talented reedman Mel Martin. Besides great originals written by the leader, the album also includes excellent performances of tunes by George Russell ("Ezz-Thetic"), Herbie Hancock ("I Have A Dream," also recently covered by Pablo Held), Victor Young ("Weaver of Dreams"), Stephen Mellilo ("In the Stars") and Martin's idol, Benny Carter (the title track "Where The Warm Winds Blow"). The opening tune, "Rhythm Man," is a killer, featuring Martin on tenor sax, Don Friedman on Fender Rhodes, and John Santos on multiple percussion instruments. Martin plays "Ezz-Thetic" on flute ("George Russell is a dean of American jazz composers as is the great Benny Carter with whom Russell got his start," Mel writes in the liner notes), but leads the sultry "In the Stars" on the soprano sax, overdubbing a bass clarinet and other reeds to great orchestral effect, also with Martin himself adding some subtle synthesized-string lines, mixed in a very low level. "Silly Hawk Walk," with tenor and Rhodes, has a delightful funky groove, reminding me of Stanley Turrentine's CTI days. A (good) impression reinforced by the Benson-esque guitar solo of Brad Buethe. Then comes the wonderful title track, written by Martin's mentor Benny Carter, showcasing the gorgeous warm tone achieved by Mel on alto flute. It's followed by Hancock's "I Have A Dream." Martin starts on bass clarinet, also uses flutes, but plays the melody and his solo on tenor, with Brad this time evoking another guitar hero, Wes Montgomery, by employing those trademark octaves. "I had transcribed many of Herbie Hancock's composition for publication and had always wanted to do 'I Have A Dream' with his original horn arrangement adapted for woodwinds," Mel reveals. "At all times during this recording, I wanted to capture what I believe to be the overriding quality of great wind playing...warmth, both in soloing and ensemble." "Blue in Green," the Miles Davis/Bill Evans gem, was cut live at the now defunct jazz venue, Jazz at Pearl's, featuring Martin's soprano and the electric guitar of fusion master Barry Finnerty, whom I first met in LA in the 70s when he was connected to people like Hugo Fattoruso (of OPA fame) and Raul de Souza. The excellent drummer Jeff Marrs uses mallets effectively, and I would like to suggest Martin to release the entire gig in a near future. In the meantime, "Where The Warm Winds Blow" - which concludes with Mel's "To Catey with Love" (a piece in 6/8 dedicated to his wife and played on soprano) and the standard "Weaver of Dreams" (tenor), the only straight-ahead quartet number on the program, with Don on acoustic piano and Robb Fisher (a veteran of Cal Tjader's band) on acoustic bass - is full of marvelous moments that guarantee the pleasure of any jazz fans. A must-have item.